A GPS watch provides an easy but effective way of getting measurements when on the course. And with a comfortable and lightweight one like the Approach S10 by Garmin, you also get something easy to use and multifunctional as it also has day and time functions. This top-notch quality GPS watch also comes with a high-resolution display that is sunlight readable and hence great for use in any weather. A GPS watch provides an easy but effective way of getting measurements when on the course. And with a comfortable and lightweight one like the Approach S10 by Garmin, you also get something easy to use and multifunctional as it also has day and time functions. This top-notch quality GPS watch also comes with a high-resolution display that is sunlight readable and hence great for use in any weather. Also, the band that comes with the watch is designed to be super comfortable and soft enough on the hand, and it is also easily adjustable to fit most hand sizes. There are also more than 41,000 preloaded courses with a free lifetime updated and a long lasting battery that will last for 12 hours on a single charge. 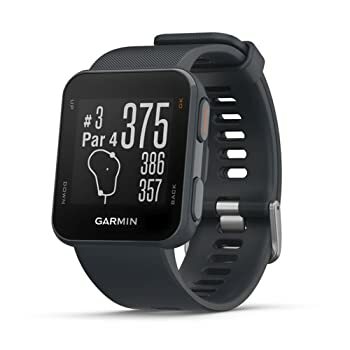 Measurements: With this Garmin golf watch you will not only get distances to the front, back and middle of the green but also the hazards and doglegs. And it maintains high accuracy for all these measurements. Display: The high-resolution display makes it easy for golfers to clearly see and read the measurements. Also, the display is designed to be sunlight-readable which makes this a perfect golf watch for use in almost any weather condition. 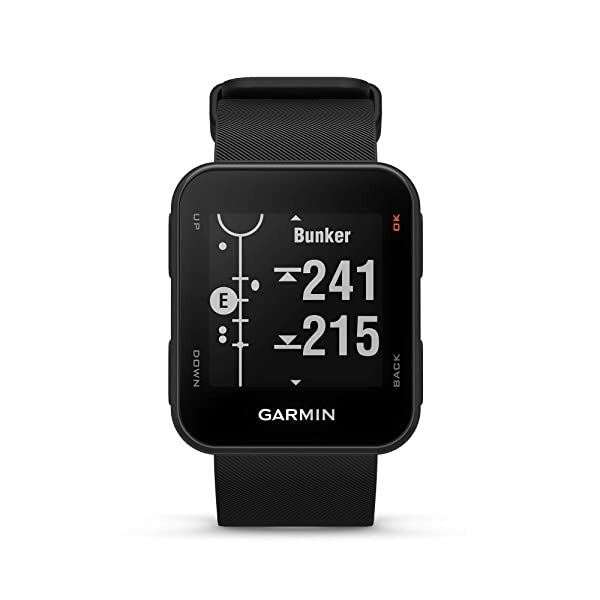 Battery: Because the battery is always a big issue when it comes to golf devices, Garmin uses a high-quality and rechargeable one on this watch that can last for up to 12 hours which means that you will play several rounds before you need to worry about the charge. Pre-loaded Courses: There are more than 41,000 preloaded courses from around the world on this rangefinder. These courses also have free lifetime updates and there are also no hidden fees or charges. Other Functions: Besides giving you accurate measurements, this GPS golf watch will also keep scores and allow you to upload the scorecard on Garmin Express for tracking rounds and it also has time and date functions. With a comfortable GPS golf watch like Garmin’s Approach S10, you will not only have all the measurements you need to play the game but also a multi-functional watch that will also give you other things like time and day. 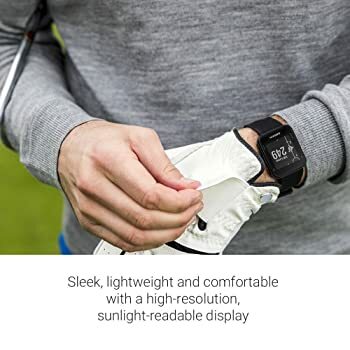 The sleekly designed and lightweight GPS watch also offers a high-resolution and display that you can easily read even under the scorching sun which makes this a perfect all-weather golf device. If all this is not enough reason to try it out then the fact that it can also keep your scores for later analysis, and that the battery will last for up to an impressive 12 hours should convince you. But, you should also not ignore the few demerits like the guide not being very beginner friendly before making up your mind. All in all, this is a great golf watch that will be highly useful on the course and hence worth buying.